It too is missing some color but has the black process, unlike the stamp proofs. 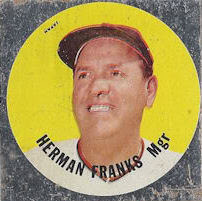 The Giants Discs were a distinct issue from the other 1967 Baseball Discs, which depicted Major League All Stars. Both Disc sets were only issued in proof form and the thinking is they were going to be turned into pins. I think a post on them is overdue and will have something in short order. Still cleaning up the hard drive kids and still finding treasure. One of the enduring words in the printing business is "artwork", which these days 99.9% of the time means "Photoshop". However, back in the days before digital, artwork meant exactly what it implied. 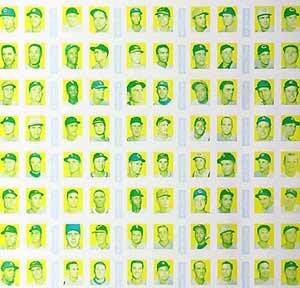 If you wanted to print a baseball card, you needed to have the "mechanical artwork" ready and in most cases this involved the work of a few different folks, namely the artist who created the work to be reproduced and the paste-up artist who got it ready to print. You can clearly see the buildup of the various layers (and evidence of rubber cement) from the bottom up, even the black neatline is there. You have the photo (heavily Flexichromed) which then has the name box with stars added on top, although I can't quite tell if the layer of stars was added first and had a large, black interior section. In turn, the nameplate (which ahs slipped) and team logo have been built up on top of that. The border of stars looks like it was added in small strips of six or seven stars as well. I never noticed it before but the top and bottom borders of stars are aligned :"straight up" while the left and right border's twinklers are off set and even more impressively, oriented left and right depending upon which side they were placed. The facsimile autograph is missing and looks like it may have fallen off sometime in the last 60 years. I'm certain this artwork would have been pasted up by the art agency of Solomon & Gelman. Actually, I'm not so sure that isn't his 1948 Bowman card shown there. It's clearly the same shot (look at the sunlight reflecting in the bottom right as well as the way his uniform is draped) but there's a little spire at the top right of the taller stand (Braves Field?) on the Topps version. By the way, Jones got his nickname since he was always available to pitch, either starting or in relief. 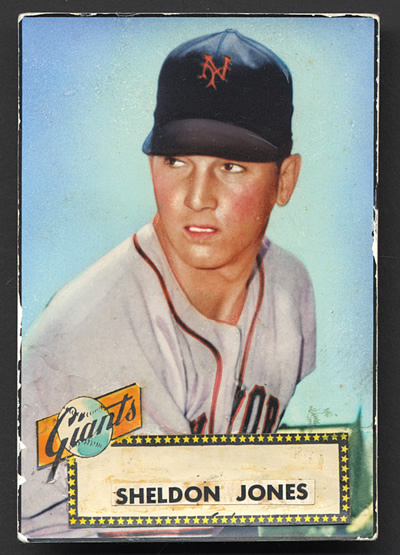 He was traded to the Boston Braves on April 8, 1952 so Topps must have finished the artwork for his card before that date, probably in very late March. Yes, it's already time for the "holiday for the rest of us"! I'll be shutting down until after the holiday in order to get the Main Topps Archives Research Center in proper trim and to rest up for the feats of strength later today. 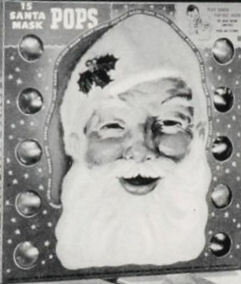 In the meantime, Merry Christmas and a belated Happy Hanukah from The Topps Archives, along with a fervent wish that you all survive the Airing of Grievances tonight! Interestingly, the mail away address seems to match that of Red Ball's parent company's HQ so I suspect Topps managed to offload a truckload of cards on the unsuspecting sneaker manufacturer! While Topps Chewing Gum is not identified per se the indicia does trumpet the pink stuff was manufactured by the "Makers of World Famous 'Bazooka" Bubble Gum". 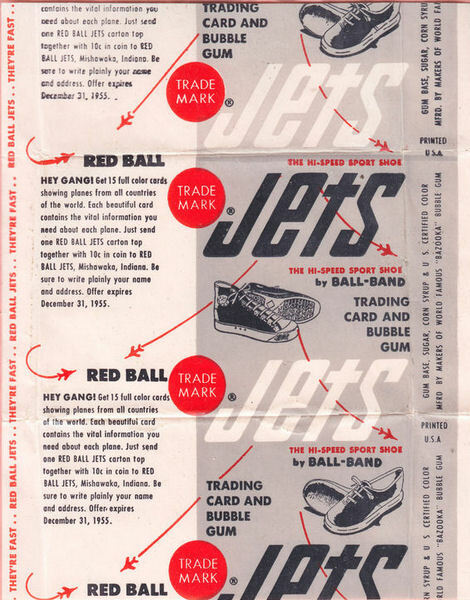 These packs are often though to contain the smaller, black & white 1956 Photo Album Jets (to use their full title) cards, but they do not and you can clearly see the Red Ball packs came out a year before Jets. 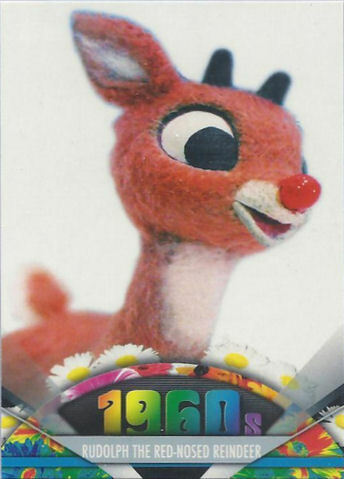 This neatly ties back to one of the first Topps Candy Division issues, Rudolph Pops, which have been discussed here previously and were issued around 1950 or '51. The times being what they are, the American Pie Rudolph had all sorts of parallel issues, etc. 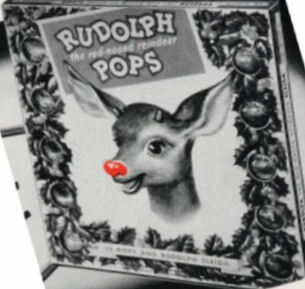 It also ties back to me, since Rudolph The Red-Nosed Reindeer is my all time favorite holiday show! With all the attention I give to Woody Gelman here, I sometimes feel like his old art agency partner Ben Solomon gets short shrift. One of the reasons is that there is far less out there, info-wise, on Ben than Woody. I am working on correcting that but I still don't have a lot of details on Mr. Solomon; in fact I'm not even sure when he joined Topps. It may have been as late as 1964 or as early as the mid 50's. I do believe he came over after Woody (who in turn, I think, was still a Solomon & Gelman partner when he went to work for and at Topps in 1952-53). I am welcoming any and all information any of you out there may have on Ben while I dig into his past. I do know he encountered Woody when they were both animators in the 1930's and that he directed about a dozen cartoons for Fleischer Brothers and Famous Studios. "For a breath of spring"?!" Well, advertising has come a long way since then baby! 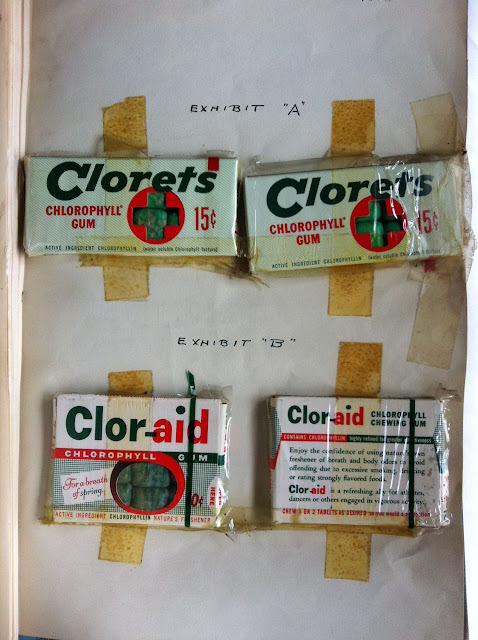 And those green gum nuggets sure look appealing 60 years later, eh? Topps tried a few strategies in the 40's and 50's to get into the "gum nugget" market, which was really the domain of American Chicle, which produced Chiclets and Clorets. We've seen one such attempt memorialized on a matchbook we discussed a few years ago when the initial "ammoniated" foray was just called Topps Gum. 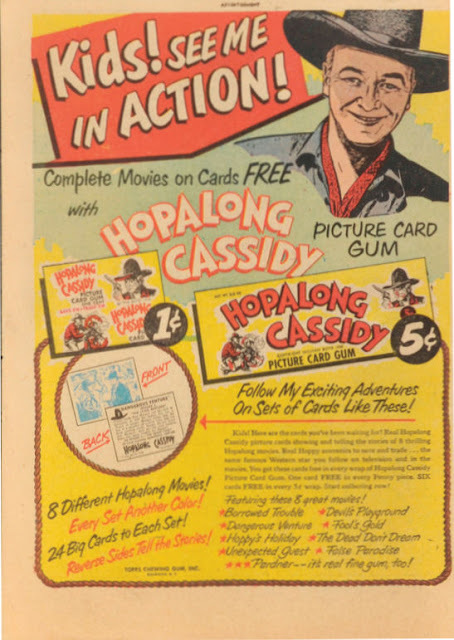 It's not yet certain that version of Topps Gum evolved from their original gum tabs of the same name but it probably did. I probably should have shown this in my post on the 1959 Fleer Ted Williams set but to tell the truth, I forgot it was on my hard drive! 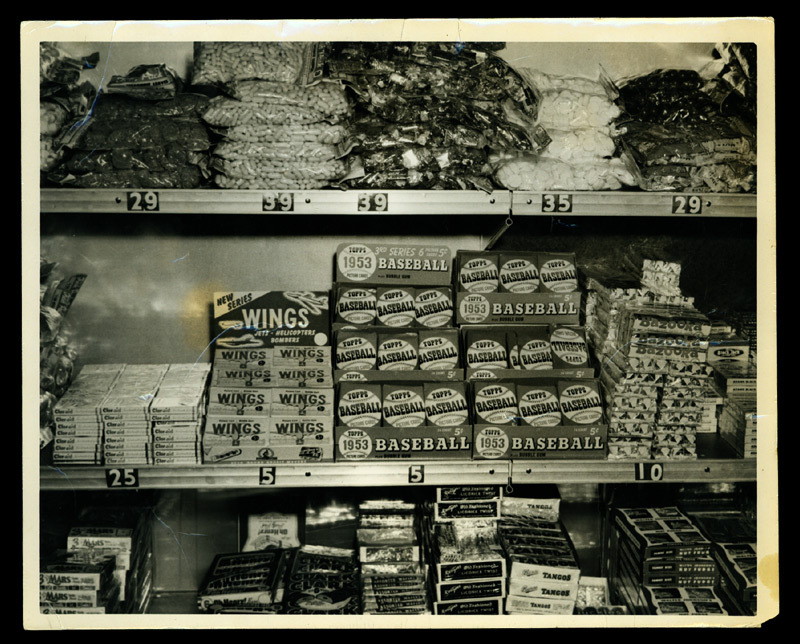 I am organizing all my scans these days during the final preparation of what I am calling The Modern Guide to Topps Chewing Gum: 1938-1956, which is nearing completion, so there will bursts of these hidden gems posted here. While final distribution details of this tome are still a couple months off, it will be available, for free, via download. It's a little hazy but you can see that Buck was to receive multiple #68's! That's why they're called the Fabulous Fifties folks! 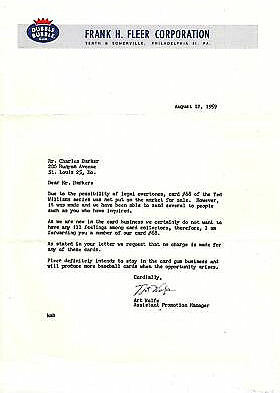 Here is a transcript of the letter, which was dated August 27, 1959. 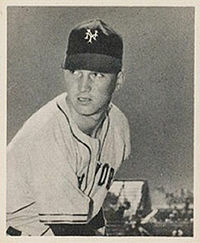 Due to the possibility of legal overtones, card #68 of the Ted Williams series was not put on the market for sale. However, it was made and we have been able to send several to people such as you who have inquired. As we are new in the card business we certainly do not want to have any ill feelings among card collectors. 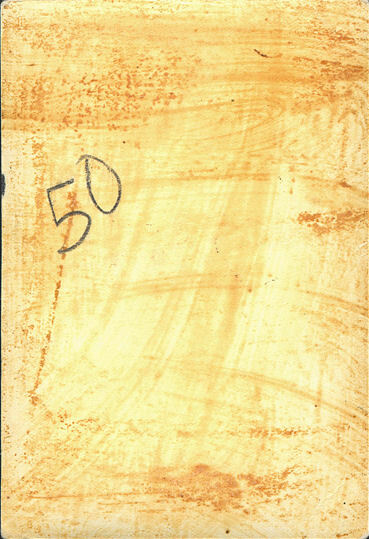 Therefore I am forwarding you a number of our card #68. As stated in your letter we request that no charge is made for any of these cards. Fleer definitely intends to stay in the gum card business and will produce more baseball cards when the opportunity arises. Well gang, I am still reeling from my close losses in the latest Legendary Auction. I missed out on two lots, one a non-Topps lot I won't bore you with and the other a treasure trove of 1950 Topps Hopalong Cassidy cards and related ephemera. There were two neat pieces in this lot I thought I would take a look at today. The "Save 'Em Trade 'Em" motto was created along with the Hoppy set and would last into 1951, used on packaging for over half a dozen sets. That's a great looking piece, pardner! 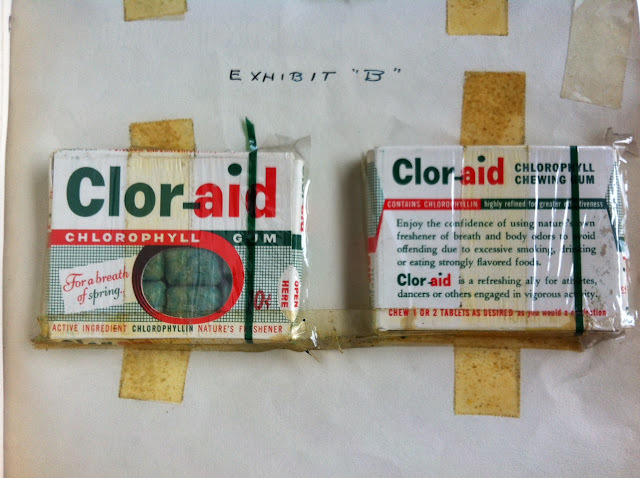 It's hard to make out but the five cent pack held six card, comprised of three 2 card panels. You can clearly see that the bubble gum was intended as the selling point, not the cards. Topps would realize in short order they had their priorities reversed but 1950 the pink stuff was king!